We often rely on the first information we hear. So one needs to be very careful not only when negotiating salaries but also – for instance - when talking to patients (doctors should really follow this advice :) as it may be very easy to do harm if the patient was first informed that about 80% of people with the same disorder usually die within a year or so while in the end further tests reveal that the patient was actually suffering from something else. We tend to overestimate the importance of information we hear. This is why heavy drinkers or smokers often argue with their doctors about negative effects of heavy drinking/smoking on their health claiming that their grandfather died peacefully at the age of 102 in spite of the fact that he drank 2 bottles of wine a day or smoked 60 cigarettes a day. People tend to follow other people. In a meeting this means that the more people have the same opinion the more people will tend to adopt it, as well. Group thinking may be one of the reasons why meetings are such a waste of time. It is much easier to watch the others and recognize what they do well (or not) than to actually recognize one's own cognitive biases. We tend to stick to choices we made although they might have been completely wrong. For instance you may think that your colleague is a great doctor even if you often need to adjust medication doses prescribed by him/her to avoid overdose. Do you often see patterns in random events? Then you might be suffering from clustering illusion, which is one of the main reasons doctors sometimes make bad decisions after seeing lots of patients with the same disease (they think that the symptoms are similar and follow a certain pattern, while in reality it is far from being true). Confirmation bias means that we only listen to information that confirm our preconceptions. 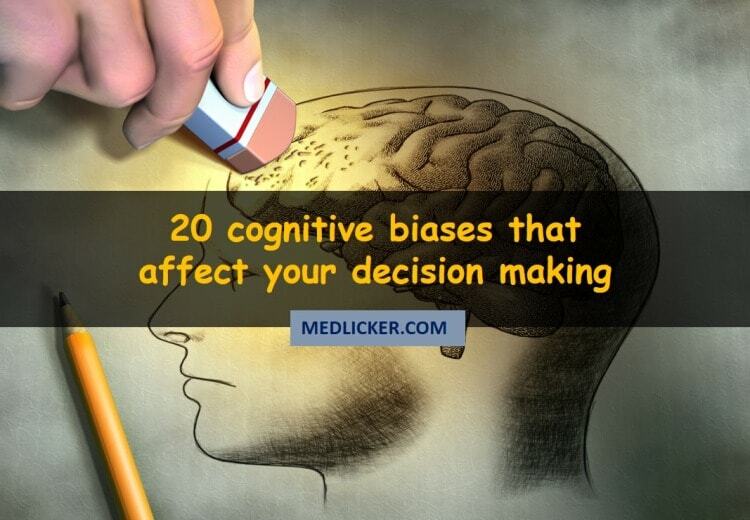 People suffering from this bias tend to be terrible teachers, scientists or doctors. Sometimes we tend to stick with prior evidence and do things we always have been doing. We are slow to accept that cholesterol might actually not be so bad for our heart as we used to be taught that it should be avoided at all cost if wewanted to decrease a risk of having a heart attack. Information overload is a reality and we sometimes search for more information on a topic although we actually do not need to do so. Too much information then harms our decision making capability. Ostrich likes to hide their head in the sand if he fears or does not like something. We, humans, tend to act in the similar way when making decisions. But ignoring negative or dangerous information will lead us nowhere and the decision will still have to be made. Many people base their decisions on past outcomes. But just because a patient survived a meningitis without being given any antibiotics does not mean that skipping antibiotics was a smart decision. Some people like taking great risks in their daily lives as they are over confident about their abilities. Famous doctors or scientists tend to suffer from over confidence much more than normal people as they are convinced that they are always right. However a disaster usually strikes when we get too confident. Placebo effect is known in medicine and it means that people believe that by taking a fake pill with no active ingredient they will experience the same results as patients given the actual medication with the active ingredient. In decision making process this bias means that we expect to get a certain effect by just believing that something we did would have such effect. Again, scientists are frequently victim of this bias. They tend to overvalue usefulness of their inventions while undervaluing their limitations. Sometimes we tend to value new information more than the old information. In research this may mean that doctors may stop using aspirin for fever treatment and start using NSAIDs (ignoring the fact that aspirin actually does less harm to the gut than NSAIDs). People tend to focus on the most easily recognizable features. For instance when thinking about a graduation exam you may worry about not passing the exam because of the fact that you forgot your exam brochure - which is a pre-requisite for being able to take the exam – at home while statistically it is much more likely that you will not pass the exam because of the fact that you will not answer the questions correctly. We tend to let our expectations affect our way of perception of the world. A bad guy will always expect the worst while a good guy usually expects the best. Sometimes we tend to expect that products have certain qualities without actually having any supporting information. Such expectations are good to identify products as useful or useless but we should not abuse or overuse this strategy. Sometimes we misjudge a situation as we only make decisions based on examples made available to us. For instance you may buy a great business course, which should teach you how to earn one million bucks in a year selling products on Amazon, yet when you actually buy the course and follow the instructions you will learn that becoming rich is not that easy as you did not have all information before purchasing the course (e.g. mainly information about the majority of purchasers, who actually purchased the course and failed to earn a dime). People tend to love certainty even if it is not good for them. We think that by eliminating all risks there is no chance of any harm being caused. 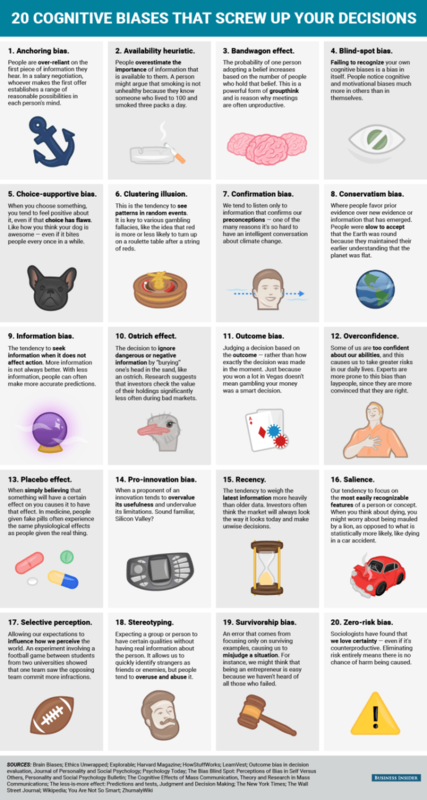 Here is a great infographic summarizing all above mentioned biases, which negatively affect our decision making (source: Business Insider).